Jews were liberated by Cyrus in Babylon in 539 B.C. 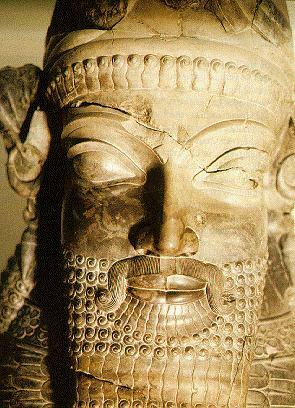 When the Arabs conquered Iran in the 7th century A.D. twelve hundred years had already passed since the establishment of the first great Iranian empire by Cyrus (Xerxes) the Great in 550 B.C. This empire, known as the Ackaemenid, stretched from the Indus river in the east to the frontiers of Greece. When Cyrus liberated the Jews from captivity in Babylon in 539 BC he issued the First Declaration Of Human Rights (Foot Note 1) a proclamation recorded on the Cyrus cylinder which accorded the conquered Babylonians freedom of worship. Overthrown by Alexander of Macedonia in 330 BC., the Ackaemenid (2) empire was succeeded by the rule of Seleucide, and then by that of the Parthians, a nomadic people of Aryan stock who remained close to their nomadic origins and whose culture was an amalgam of Iranian, Hellenistic and Mediterranean elements. In 226 AD the second great Iranian empire, the Sasanid, was founded by Ardashir Papakan, and lasted for four hundred years until overthrown by the Arabs. The Arab conquest changed the whole course of Iranian history. Islam, the religion of the conquerors, superseded the ancient Iranian faith, Zoroastrians. Arabic, the language of the conquerors, replaced Iranian as the administrative and cultural language of Iran for nearly five centuries. During this period most works written by Iranians in the fields of theology, Philosophy, Medicine, Astronomy, (3) Philology, Mathematics, and even history, were written in Arabic, in order to ensure their widest possible circulation from Spain and Morocco to South-East Asia. Farsi continued to be Spoken, of course, and the first branch of literature to reappear in the Iranian language was, not surprisingly in view of its tradition of oral transmission, poetry. In 1258 AD, Iran was absorbed into the Mongol Ilkhanid state. The boundaries of the Ilkhanid state corresponded approximately to those of the Sasanid empire, and it is therefore no coincidence that Hulegu, its Mongol founder, was referred to in one mediaeval European chronicle as " Imperator Persidis", " Emperor of Persia". Between 1381 and 1404 , the break-up of Ilkhanid empire left a power vacuum in Iran in which tow confederation of Turcoman tribes and other forces fought for supremacy for century, Finally, in 1501 a new dynasty, the Safavids (4) restored stable government to Iran and many with justice be regarded as the founders of modern Iran. The greatest ruler of this dynasty, Shah Abbas I (1588-1629 AD), created a multicultural society in which foreign merchants, encouraged by the climate of religious tolerance, lived and worked in Iran. The European powers, including Spain, Portugal, and in particular England were frequented Iran by "ambassadors". The power of Safavids declined, and in 1722 Afghans captured their capital. Isfahan, (5) and for seven years ruled central and southern Iran,. Although Nadir Khan Afshar brought the Afghans interregnum to an end, he left Iran in a state of administrative and financial chaos, and his assassination in 1747 was followed by half a century of civil war between rival Zand And Qajar factions. The victors in this war, The Qajars, ruled Iran until 1921, when a coup d'etat by Reza Khan (6) ultimately unshelled in the Pahlavi Dynasty, (Foot Note 7) which ruled Iran into the modernization, until the Islamic revolution of 1979.